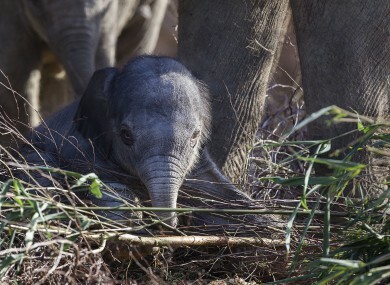 DUBLIN ZOO HAS welcomed the birth of a new elephant calf. The herd’s matriarch Bernhardine, or Dina, gave birth to her third calf on Monday night and the 1-metre tall, 80kg female baby elephant is safe and healthy. The new arrival will join the nine-strong herd of Asian elephants at Dublin Zoo, and is the fifth calf to be born there in less than three years. The calf was finally born after a 22-month gestation period. Gerry Creighton, operations manager at Dublin Zoo, said that they were all delighted with the arrival. “Both mum and calf are doing great,” he said. The calf is feeding exceptionally well and has settled into her surroundings seamlessly. The birth of this latest calf forms part of an international breeding programme established to assist the survival of the Asian elephant. A statement from Dublin Zoo said there are only between 30,000 and 60,000 of the animals left in the wild, with the largest population in India. Email “Dublin Zoo celebrates a very adorable new arrival”. Feedback on “Dublin Zoo celebrates a very adorable new arrival”.